Saturday, April 29 at 6-9pm during Indie Bookstore Day. Author Dave Edlund presents “Hunting Savage”, his latest installment in the political thriller series. 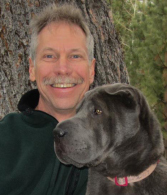 Because one of the main characters in Hunting Savage is a dog, Diesel (pictured here), Dave has decided to contribute a portion of his earnings from the book sale to the Humane Society of Central Oregon.